Umbrella rigs are versatile systems that enable you to imitate a school of baitfish. 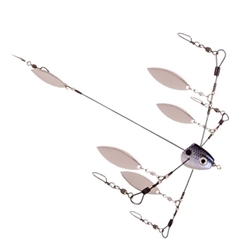 Strike King's Tour Grade Titanium Bladed Umbrella Rig is a better rig than others. The five wire system is designed with a .027 diameter titanium wire that eliminates kinks, breakage and metal fatigue common with some steel wire rigs. the flexible titanium wire enables increased pulsing action of the lures for better action and more strikes. the smaller diameter wire creates less wind drag, making casting easier and the life-like head with life-like 3D eyes features an internal swivel to prevent line twist.